Each year, one individual is selected to receive the NBA Lifetime Achievement Award. For 2018, the selected recipient will receive his or her award at our 2018 Professional Development Conference in Detroit, Michigan. The awardee is selected by the NBA Board of Directors, after a careful review of submitted nominations. If you would like to nominate someone for this year’s award, we encourage you to submit their name and a short description of their accomplishments today. The deadline for submitting nominations is August 1, 2018. We are very excited to announce that registration for the 2018 NBA Professional Development Conference is live!!! For this year’s annual conference, we’ll be hosted by the Westin Book Cadillac Hotel in Detroit, Michigan on October 24, 25, and 26. For those unfamiliar with our annual conferences, we pack three days with a wide selection of workshops specifically tailored to braille transcribers and teachers of the visually impaired. Our lineup of experts is well underway in their preparation of creating workshop materials intended to help you gain a better understanding of the latest transcription codes, and how best to apply them in your daily work. On each day, there will be a workshop session in the morning and in the afternoon. Attendees may select one option from a list of five offerings during each session to sit in on. Our planning committee is always sure to include options from each discipline of braille transcription. If you focus on Music Braille, or textbooks, or need to know more about Nemeth and Unified English braille, there’s a workshop designed just for you. In addition to our usual wide ranging topics, this year we’ve expanded the lineup to include a workshop to help those of you working with assistive technology! We haven’t hosted a conference in Detroit in quite some time and we’re looking forward to returning! Our hotel is right downtown with easy access to a vibrant list of restaurants, cultural museums, and activities. Though the Westin Book Cadillac is considered a luxury hotel, we’re sensitive to the plight of our attendees who we know often work with strict budgets. We’ve arranged for a room block at the hotel at a special rate, which you can access by contacting the hotel directly to book your accommodations. For more on the room rates, you can visit the registration page here. Registrants will have a chance to select the Partial Conference or Full Conference package. The difference between the two options primarily lies with the selection of a meal package. The Full Conference package will include a lunch on Wednesday, a banquet dinner on Thursday evening, and then a closing lunch on Friday. The meal functions at an NBA conference certainly include food, but they also include the handling of important business by our membership, installation and voting of new directors to our board, and awards. Attendees find that our meal functions are a great opportunity to network with other industry professionals. Regardless of the package selection you choose, all are invited to our President’s Reception on Wednesday evening. For those selecting the Partial Conference package, and for all other meal times, the hotel has a few options in-house, and there are easily accessible eateries in the surrounding areas to the hotel. One of the biggest changes to our conference this year is in response to our most frequent request! For this conference, all attendees will receive digital access to all workshop materials!!! This is a change that people have been requesting for years, and we’re responding by making it happen. Though attendees will still be choosing what workshops to sit in on, as part of your paid registration, you’ll receive digital access to the materials used in the other workshops. We’ll be sure you have access to these in advance of the conference, so if you’re the type of person who prefers paper-copies of materials, you can print the materials at home for the workshops you’ll be sitting in on. Or, if you’d prefer, for a fee selected at registration, we’ll print the materials for the workshops you’ve selected and put them together in a binder for you. As always, our braille reading attendees can select to have hard-copy braille materials prepared at no additional cost. Participants choosing a hard copy option will still have access to all of the digital print and digital braille files that everyone else will receive. One of the features of our conference is an Exhibit Hall, where vendors set up booths to interface directly with our conference attendees to share information about their products and services. The Exhibit Hall will be open on Wednesday afternoon, and all day Thursday. If you’re looking to register as an exhibitor and would like more information, feel free to contact our office directly. You can also find information regarding the vendor booths here. During the same time that the Exhibit Hall is open, we’ll once again have our Silent Auction. The money raised during the auction goes directly to supporting the programs and services provided by the National Braille Association. While we are grateful for the financial support generated by the auction, we also look forward to how much fun it always is! We are already beginning to collect items for this year’s auction. If you’d like to contribute an item(s) for this year’s auction, feel free to send it along in advance with a note about who it is from, and an estimated value. You can ship to: NBA Silent Auction, 28244 Aspen Blvd, Flat Rock, MI 48134. Available only to members and first-time attendees to the conference, there are two available scholarship awards made available by the generosity of our late, past president Mary Archer. She knew the importance of getting first hand instruction from an expert, and she knew that not all transcribers have the financial ability to attend professional development conferences. Mary set up a financial account specifically to be used to help new attendees get to our conference. Two winners will be selected, and the cost of registering for the Full Conference package will be covered by Mary’s generous legacy. If you are a current NBA member, and would like to attend our conference for the first time, you can find a scholarship application form in one of our Bulletins. We really are excited about this year’s conference, and we hope you are, too! If you have questions or need to discuss a detail about attending, please feel free to contact us here in the office. We hope you’ll consider joining us in October. For information about the conference and to register today, use this link. This season has been a busy one, and we’ve made a lot of announcements recently. We wanted to take an opportunity and touch base this week to provide an update on everything that is happening with NBA! 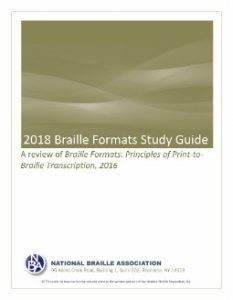 Last month we published the 2018 Braille Formats Study Guide. Though the study guide is not a required purchase before taking the Formats Exam, many find that using the publication is a great way to prep for getting certified. It’s available in our website store in print and ebook for $50.00 for either edition. We still aren’t ready to make the Braille Formats certification available yet. Since the release of the newest code, we’ve been focusing our efforts on getting the study guide available so you can begin learning the material. As soon as the certification exam is available, we’ll be announcing it here right away–so stay tuned! We’ve heard that you’re excited for the 2018 Professional Development Conference this October in Detroit, Michigan. We’re excited, too! We have a lot of great things planned for this year, including a change to how materials will be distributed. There are still a few final touches to wrap up on a couple details that we are planning. Once those are finalized, we’ll be making registration for the conference available. We’re hoping to have that out very soon. In addition to the 2018 Braille Formats Study Guide, we also made available the braille edition of the Braille Enthusiast’s Dictionary. The popular transcriber’s reference book is available in print through SCALARS Publishing directly, but NBA has always been the place to get the publication in braille. It can be found in our website store for $220.00. We continue to offer three of the free, 15-minute webinars each month. Anyone can attend these, and information on how to join can be found in a blog post published each month. If you’re looking for information about April’s lineup, you can find that post here. Remember, if you’re a current member of NBA, you can sign in with your account to our website and watch all of the previously recorded free webinars! 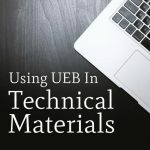 Beginning April 10, NBA is presenting a month-long, four-hour webinar called Using UEB in Technical Materials. Each Tuesday, presenter Wendy Benckhuysen will lead the online workshop in one-hour increments. There are still a few spots left in this webinar, but attendance is limited. If you’re hoping to attend this paid session, you can purchase a registration right here in our website store. Last November, Cindi Laurent presented a paid webinar on Braille2000. We’ve made a recording of that webinar available to purchase or rent. Members receive a 50% discount on the webinar replay. To get your member discount, you’ll find a code in the Member’s Section of our website to enter during checkout. You can find a link in our Web Based Learning page, or directly on Vimeo. As we have new information about all of these topics, we’ll continue to update you by posting here on our blog. Stay tuned for conference news, webinar announcements, and the upcoming Spring Bulletin! This month we are introducing two new publications to our library. Both have been widely anticipated, so we’re excited to make them available! With the adoption of Unified English Braille, the Braille Formats code required a substantial update. Since BANA’s release of Braille Formats: Principles of Print-to-Braille Transcription, 2016, our committee of experts have been re-writing educational materials to incorporate these changes. While a certification in Braille Formats doesn’t require the purchase of the Study Guide, many who are seeking certification find that the simple outline of the Study Guide is a great way to learn the new concepts. We’ve made the Braille Formats Study Guide available as a spiral-bound print publication and also as a PDF download. Either edition is available for $50.00. For the print edition, there is no additional cost for shipping within the United States. 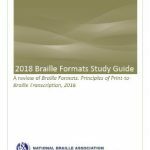 To read more about the Braille Formats Study Guide and to purchase, you can visit the product profile in our website store. 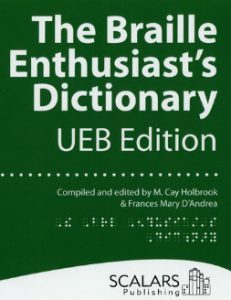 Compiled and edited by M. Cay Holbrook & Frances Mary D’Andrea, the newest edition of the Braille Enthusiast’s Dictionary available from SCALARS publishing is the perfect companion for a transcriber or teacher of the visually impaired. Featuring over 30,000 English words, the dictionary serves as a resource to quickly reference many common braille transcriptions. The print edition of the Braille Enthusiast’s Dictionary is available directly through SCALARS, but the National Braille Association is the exclusive provider of the eight-volume braille edition of this title. The braille edition is now available to purchase in our online store for $220.00. Stay tuned as we continue to add more titles to our existing lineup of educational materials for braille transcribers and teachers of the visually impaired! For over 70 years, the National Braille Association has been guided by a volunteer Board of Directors. It is now time to nominate individuals to fill the upcoming board vacancies that will be available in the Fall of 2018. Those selected to serve in the officer and director positions listed below will be installed at NBA’s Professional Development Conference in October, in Detroit, Michigan. We encourage all members of NBA to become involved in this nominating process by submitting the names of individuals for director positions and by selecting current directors to serve in officer positions. Directors serve a three-year term; an elected director is eligible for a second consecutive term. To be eligible to serve as a director, an individual must be a member in good standing of the Association for at least one year prior to election. An elected director who has served two terms shall be eligible to serve as a director after a lapse of at least a year from the expiration of his or her last term as director. The Vice President will serve a two-year term and will be eligible for a second consecutive two-year term in the same office. To be eligible for an office, a candidate must be a current director in good standing for at least two years. An officer, upon expiration of his of her second term, shall be eligible for election to another office or as a director. The Secretary will serve a two-year term and will be eligible for a second consecutive two-year term in the same office. To be eligible for an office, a candidate must be a current director in good standing for at least two years. An officer, upon expiration of his of her second term, shall be eligible for election to another office or as a director. If you would like to nominate someone for a director or officer position, we invite you to submit his or her name, a summary of their skills and experience, and their contact information using the form below. All nominations must be received by December 31, 2017. Now that registration for the 2017 Professional Development Conference in Orlando is underway, it is time for us to extend the invitation to those wishing to reach our audience as a business. 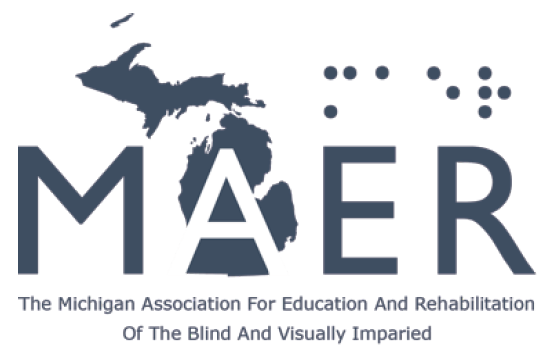 At each conference, vendors who have a product or service that would be of interest to braille transcribers and teachers of the visually impaired have a few opportunities to showcase themselves. Registration for vendors is now available for those wishing to have a table in our Exhibit Hall, sponsor a portion of the conference, or advertise in our conference program. If you are a business representative wanting to position your brand so that it reaches our conference attendees, we invite you to explore the options we’ve made available. Businesses wishing to tell our attendees about a product or service without needing a table can purchase a spot in our conference program. Different sizes are available for varying price points, so regardless of your resources, there is likely an option that will suit your needs. As you may have guessed, putting on a three-day conference is a costly endeavour for a non-profit organization! We invite your business or organization to assist NBA with a portion of the conference by choosing a sponsorship level most appropriate for your needs. To show our gratitude, we will happily recognize your involvement as a sponsor of this year’s conference in various ways. For a more detailed description of each of these options, you can visit the Professional Development Conference page of our website and download a description of the sponsorships. Additionally, you can use the link on that page to register as a vendor for one of the options described above. As always, if you have questions or wish to be in touch with us directly, feel free to contact us here in the office. We are very excited to officially invite you to our 2017 Professional Development Conference! Typically, we have registration for our conferences open about four-to-five months in advance. We know many of you working in school districts have to submit budgets for the fall during your spring semester. So, this year, we worked extra hard to be able to allow registration to begin earlier than ever! As you may already know, this year’s conference will take place in Orlando, Florida, and our host hotel will be the Embassy Suites Lake Buena Vista South. Our room block includes nightly accommodations for $149.00. Reservations for guest rooms can be made by calling directly to the hotel. 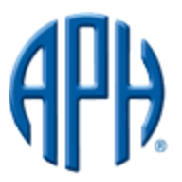 For more information on our hotel choice, you can visit their website here. For those of you familiar with our Professional Development Conferences, there are a few changes this year that we wanted to tell you about in advance. Instead of our Thursday/Friday/Saturday routine, we have adjusted the schedule so that workshops will take place on Wednesday/Thursday/Friday. The dates for the conference will be October 25, 26, and 27, 2017. As always, our Exhibit Hall will be available the afternoon of the first day and the entire second day of the conference. If you are a vendor wanting to join us to exhibit, please stay tuned to this page for more details on how to register. In the past, we have always made individualized binders with printed handouts for each attendee. Over the years we’ve noticed that more and more of you are bringing laptops, and space on the tables in workshops is being used by both laptops and large, heavy binders at the same time. To help save room in workshops, and to keep registration costs from rising, this year, the default option for receiving materials at the conference will be in PDF formatted files on a thumb drive. If you prefer the printed materials arranged in a binder, that option is still available when you register for an additional cost. As always, there are no additional costs for those wishing to receive their materials in braille. Just as with previous conferences, attendees will only be able to receive the materials for the workshops in which they are registered. To join us in Orlando this October, you’ll want to register sooner than later to ensure a spot in your preferred workshop sessions. Visit our registration website for more information and to register your spot today! For over 70 years, the National Braille Association has been guided by a volunteer Board of Directors. It is now time to nominate individuals to fill the upcoming board vacancies that will be available in the Fall of 2017. Those selected to serve in the officer and director positions listed below will be installed at NBA’s Professional Development Conference in October, in Orlando, Florida. Directors serve a three-year term; an elected director is eligible for a second consecutive term. To be eligible to serve as a director, an individual must be a member in good standing of the Association for at least one year prior to election. An elected director who has served two terms shall be eligible to serve as a director after a lapse of at least a year from the expiration of his or her last term as director. Two director positions need to be filled. Two current directors’ terms are expiring. Robert Beaton is eligible for another term as a director or an officer position. Carol Greer is eligible for another term as a director or an officer position. The President-Elect will serve a two-year term, will serve as President for two years and will serve as Immediate Past President for two years. Jan Carroll, whose term as Immediate Past President is expiring, is eligible for another Officer position or a Director position. The Treasurer will serve a two year term and will be eligible to serve a consecutive two-year term in the same office. Diane Spence, whose term as Treasurer is expiring, is eligible for another Officer position or a Director position. To be eligible for the above officer positions, a candidate must be a current director in good standing for at least two years. An officer, upon expiration of his or her second term, shall be eligible for election to another office or as a director. If you would like to nominate someone for a director or officer position, we invite you to submit their name, a summary of their skills and experience, and their contact information using the form below. All nominations must be received by February 28, 2017. Ever find yourself wondering how to handle unique page numbering situations? Led by the chair of NBA’s Braille Formats/Textbook Committee, our first webinar of 2017 is designed to help you determine how best to transcribe page numbers. Just like our recent programs, January’s webinar is free to anyone who is interested! This webinar will look at print page numbers. We will discuss combined pages (when to combine and when not to), alphabetic page numbers, pages without print page numbers and page numbers with alpha-numeric numbers. As usual, there is no need to register in advance. A few minutes prior to the start of the webinar, navigate your browser to this link and choose to either dial in with a phone or use your computer/tablet/smartphone’s built in audio. To dial in with a phone for audio from within the United States, call (669) 224-3319 and use access code 316-420-189. To join from Canada, please dial (647) 497-9372. Space for the webinar is limited to 25 attendees. For additional information or questions, please contact our offices directly. Please note: This post was first published yesterday but has been updated. This webinar will last approximately fifteen minutes. We are excited to continue our webinar offerings with the next training focused on the newest version of Braille2000 to take place on Friday, December 2, 2016. This fifteen-minute webinar is free to anyone who is interested in learning more about some of the new features in Version 2 and how to apply them to your work. 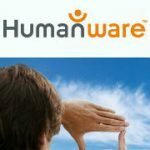 Description: In this webinar, we will look at some time saving features of Braille 2000 version 2. You will learn a quick way to do contents pages that have been scanned from print. We will also look at some of the other new features of Braille 2000 and how to use them to your advantage. There is no advance registration required, though attendance will be limited to the first 25 individuals who join. Because space is limited, we ask that if you have multiple individuals in your program/organization, that you buddy-up and use one computer, saving room for others who might not have that luxury. We hope you’ll have an opportunity to join us next week to learn more about Braille2000 V2! If you’re not able to make it for this next webinar, stay tuned as we announce more offerings in the future.